Pumpjacks pull crude to the earth's surface at this well site in North Dakota's Bakken oil patch. They did the survey again in 2013 -- also looking at the Three Forks formation -- and determined the number was twice that amount, a whopping 7.4 billion. “Because of the advent of new technologies such as hydraulic fracturing and directional drilling,” said Walter Guidroz, energy resources program coordinator with the USGS. This holds true in other formations, like the Mancos Shale in Colorado. Last year, the USGS said the natural gas industry could produce up to 66 trillion cubic feet of gas there, an astronomical jump from previous estimates. That’s enough gas to power the entire country for more than two years. When these numbers increase, it’s really good news for the oil and gas industry. Sen. John Hoeven of North Dakota said the uptick in his state’s 2013 estimate meant energy companies had confidence that investing here would pay off. That confidence helped usher in a whole host of services to booming oil patch communities, like pipelines, trains, new roads, housing, restaurants and other amenities, he said. This proved a huge boost to North Dakota’s economy, contributing to the fact that the state now has the nation’s lowest unemployment rate. Now, Hoeven is urging the USGS to re-do the survey to see what 2017 looks like. “To continue to make those investments, we have to continue to make the case this play is going to continue to be here a long time, 10, 20, 30, 50 years,” he said. Shale plays like the one here in North Dakota are competing for those dollars and the jobs they bring. The Bakken faces competition not just from other hot plays like the Permian in Texas. It’s also competing against foreign players like OPEC, the cartel of petroleum exporting countries. Hoeven said companies like ExxonMobil do business globally and have to choose where to make their investments. “We want their investments here,” he said. 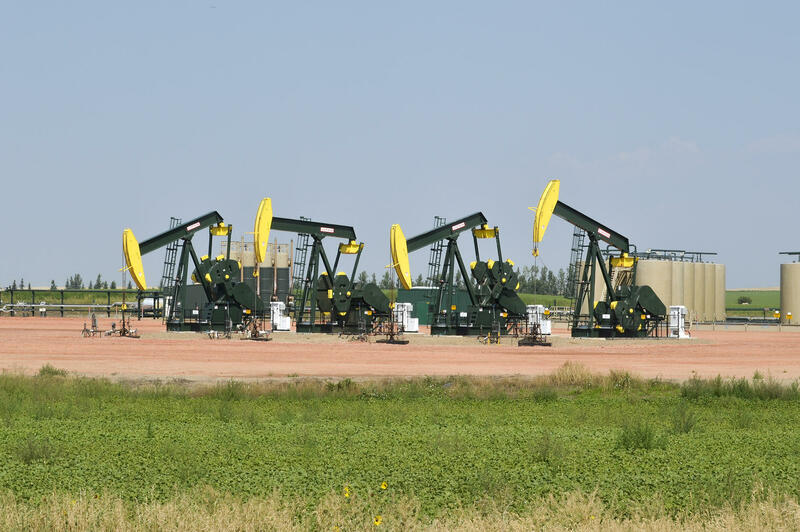 But there’s no guarantee a new estimate would come up positive for North Dakota’s oil future. Guidroz said the USGS won’t speculate. “The numbers could go up, they could remain about the same, they could go down,” he said. A new estimate would rely in part on data gathered by the oil and gas industry since 2013, such as the number of new wells and how much oil they produce. As for Hoeven, he has no problem speculating. “I believe it will go up not only because we know more about the actual energy resource but also because our technology has advanced so much,” he said. Thanks to those new technologies, operators are able to squeeze more oil out of the ground. This is key for the USGS. It's estimates aren’t based on how much oil exists in a shale play, but how much can be extracted given today’s technology. Agency officials say they will reach a decision in a week on whether to update their estimate for North Dakota’s oilfields. That decision depends, in part, on whether enough has changed in the oil patch here since 2013 to make that new survey necessary.